The use of Advanced Stop Lines (ASLs) for cyclists at signal junctions is now widespread. They are intended to provide a safe location for waiting cyclists, especially those turning right. The Traffic Signs Regulations and General Directions (2002) (DfT 2002) clarified the legal position of ASLs and made it an offence for other vehicles, including motorcycles, to cross the first stop line and wait in the zone between stop lines, unless it was unable to stop safely. However, ASLs for two-wheelers at large intersections have been introduced in parts of Belgium, the Netherlands and Switzerland. Several trials and pieces of research have revealed potential benefits of allowing ASLs to cater for motorcyclists. However, the results are generally considered to be inconclusive and many would welcome further research on safety and benefits for all in order to draw stronger conclusions. If the rider keeps close to stationary traffic in light of the above, this increases the risk of collision with an open door of a car. Conflict with pedestrians crossing through stationary traffic. Many pedestrians, having crossed an empty bus lane and stationary traffic lane, assume their next hazard is traffic from the opposite direction and fail to look for filtering motorcycles. Eliminating the risk of conflict with oncoming traffic while the rider is using the bus lane. Reducing the risk of conflict between motorcycles and other traffic. Even if a car occupant opens a door on the nearside, they are more likely to check for vehicles in the bus lane and, in any event, the motorcycle is likely to be in the centre of the bus lane where they are visible, not close to the stationary traffic. Reducing the risk of conflict with pedestrians because they will check for vehicles before crossing the bus lane. Bus lane access for motorcyclists was first granted by Avon County Council in Bristol in the mid 1990s. Since then an increasing number of local authorities have allowed the shared use of bus lanes by cyclists, taxis and motorcycles. In 2007 The DfT produced a Traffic Advisory Leaflet TAL 2/07 “The Use of Bus Lanes by Motorcycles”. This reversed previous advice against the practice and now recommends that local authorities actively consider it. In London, assessment of PTW collisions showed that six out of eight case studies did not involve an adverse effect on casualties and the measure did not lead to an increase in collisions. Following the completion of two trials, Transport for London granted motorcyclists permanent access to bus lanes on the majority of the city’s red routes from January 2012. Benefits cited included reduced journey times and less carbon dioxide emissions. The Traffic Signs (Amendment) (No.2) Regulations and General Directions 2011, which came into force on 30 January 2012, allowed for the inclusion of new signs (diagrams 958A and 959A) permitting solo motorcycles to use near-side, with-flow bus lanes. Both signs may be combined with the times of operation sign (diagram 961). Local authorities are best placed to decide whether to allow motorcycles into with-flow bus lanes. Each case must be examined on its merits and fully consider published research, case studies and all potential advantages and disadvantages. The use of road markings needs careful consideration, especially within motorcycle steering, braking or accelerating zones. Used inappropriately they can force riders off the safest line or, if poorly designed or laid, can collect and divert water which may diminish consistent grip. The reduction in skid resistance over time or in wet conditions causes problems for motorcyclists. Direction arrows and destination markings are of particular concern where large areas of thermoplastic marking are used. Often they are used on bends when they could be better placed in an advanced position on a straight section of the road. Further, they are likely to be re-laid on maintenance schedules, leading to layering and a significant up-stand from the surrounding surface; most road markings over 6mm in height are unlawful with a few exceptions for example rib line markings. ‘Blacking out’ redundant markings rather than burning or planing them off creates a higher up-stand with the added hazard of reduced skid resistance. In general, well positioned roadside advance warning and directions signs are preferred to surface markings. 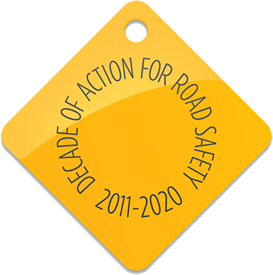 Count-down strips, rumble strips and coloured surface treatment should not be used close to or on bends or where steering or braking is required, unless constant skid resistance is guaranteed. Lining or hatching used to reduce apparent carriageway width in urban situations can squeeze low powered motorcycles and cycles into conflict with other traffic. This should be balanced against any anticipated general safety benefits.